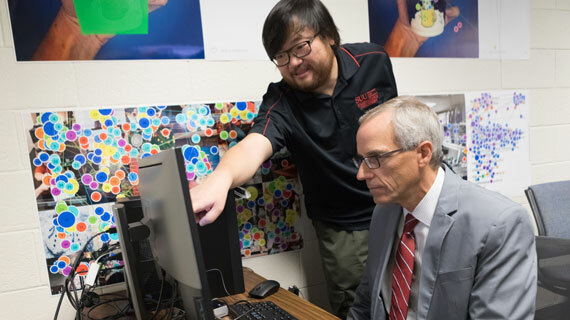 Southern Utah University has recently created a unique opportunity for students to utilize state-of-the-art eye tracking software. The Tobii eye tracker is a valuable tool that aids in research, education, evaluating statistical data, web design, and business and marketing planning. This is the first semester SUU’s eye tracker will be used in curriculum. Generous funds for the Tobii Pro Lab and Tobii Studio devices came from Provost Brad Cook and the College of Humanities and Social Sciences. SUU Communication Professor Lijie Zhou encouraged and prompted the department to acquire this new research tool. Much of Professor Zhou’s graduate research revolved around technology, specifically eye tracking. A variety of students and classes will be taking advantage of the eye tracker for classroom benefits. The eye tracker helps students become more comfortable with statistical data and understand how to interpret it. Having the eye tracker has been a great tool that has pushed me in my educational research,” said communication senior Sadie Hanning. The eye tracker shows how many eye movement patterns a consumer makes while navigating a website. The system provides eye pattern paths, heat test results, and statistical data for interpretation after a simulation test. This information is valuable for clients because it can help increase profits after a website redesign. Consumers often don’t make a purchase if a website is difficult to navigate, visually distracting, or visually unappealing. Eye tracking is a growing research field and applies to many different areas of expertise including business, marketing, communication, psychology, and media. The next advancement in eye tracking will be virtual reality eye tracking. “My hope for the new eye tracker is to spark an interest in students and apply transferable skills to their future careers,” said Zhou. The communication field is rapidly growing, mostly due to the influence of social media. SUU’s communication department stays current with professionally trained staff and hands-on approach to learning. Students traditionally rank high in regional and national competitions for journalism and broadcasting. Learn more about SUU’s communication department.